So, you’ve been diagnosed with sleep apnea and a machine called CPAP has been recommended as a course of treatment. CPAP machines might look and sound pretty terrifying at the beginning, but understanding how it works can help put your mind at ease. After a brief period of discomfort to adjust to this treatment, you’ll be able to begin enjoying a better night’s rest. At Bogrow and Associates, your Southfield dentist wants to make sure that you are educated about your CPAP and its benefits to help alleviate any concerns. 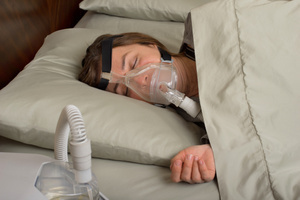 CPAP, or continuous positive airway pressure, uses a ventilator to apply positive air pressure to your airway using a nose mask, helping keep your airway open so you can breathe better. The mask might take some getting used to, but it’s made so you can sleep without having to worry about disruptions in your breathing pattern. There are different types of masks to fit your face. Your sleep apnea treatment team will help make sure you find the perfect mask and machine for you. Animals use CPAP– Certain types of and breeds of animals such as bulldogs, which frequently experience difficulty breathing, can use CPAP. It was invented in 1980 by an Australian physician named Colin Sullivan. They’re extremely quiet–The machine won’t disrupt your partner, as CPAP machines are built to be quiet and allow a good night’s sleep. Finding the right fit takes time–It might take a few different fittings to find the right fit, and it’s okay to continue to check back with a tech to ensure the fit is still right. Using CPAP can improve your health–Using your CPAP machine consistently over time will help improve your overall health, allowing you to sleep better. It will help you achieve REM sleep–You’ll feel so much better and be more productive when you’re getting a great night’s sleep. You get used to it–Sleeping with the mask might feel strange at first, but you’ll get used to it the more you use it. Not all machines are the same. Different CPAP machines work better for different people. Your doctor will work with you to find the perfect fit. Dr. Bogrow can help you sleep better by working with local health professional to diagnose and use treatment to alleviate disruptions in your breathing. Sleep apnea is a very serious condition that shouldn’t be ignored because it can severely damage your health. To explore your treatment options, contact our Southfield sleep apnea dentist today!